There’s a flu remedy I believe in. It’s pretty popular in the US and less well known in Britain, where the long spells of cold and damp certainly require some of the fire offered by this “cider” — really, Apple Cider Vinegar. 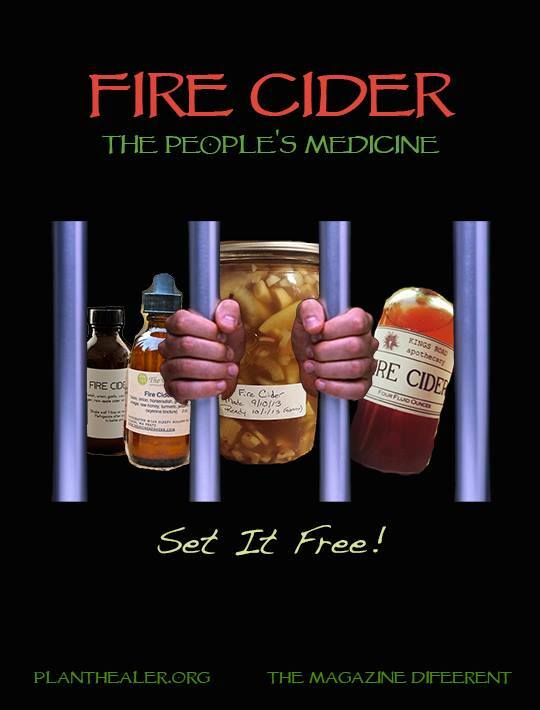 Fire Cider is a nutritional supplement, really. It’s considered “traditional”– of course it seems to take a multi-pronged approach to “tradition,” –but no worries — and has entered the DIY healing vernacular. I make it, and I take and give spoonfuls when extra immune boosting is needed, a cold or flu coming on, or an infection rises somewhere in the body. I often drink diluted vinegar anyway for a certain kidney-ish ache I seem to get if I eat too much cheese, and the discomfort slowly recedes. Fire Cider is extra powerful. I prepare mine every year by finely chopping, in various relative quantities: onion, garlic, ginger, dried chills, horseradish if I have it (which is rarely), turmeric, maybe oregano– all the famous goodies. This article has good variations and tells the story well, with variations and possibilities. They add honey– I never have, but what a good idea. There’s no need for strict rules. Steep your concoction in ACV (as the hipsters call it) for as long as you wish (3 weeks or longer), then strain. I tend to use what I’ve strained out as a marinade for spicy pork dishes. You can be creative of course — make a soup– add it to anything really — marinate your tempeh, eat it plain if you’re feeling brave. And if you are on Facebook, there’s a really fun action page called Tradition Not Trademark with photos people send in of their own homemade Fire Ciders and themselves toasting to the Fire Cider movement, and the plea to let local retailers know that the trademarked brand is stepping on our toes indeed! I seem to find something useful in every post of yours that I’ve read so far. Thank you. Since I started blogging, I’m often pleased to find a blog that has many things that coincide. In life when you take this lifestyle choice, meeting people with similar interests and skills to share is so much harder. I’ve just added a permanent horseradish to our plot so that we can have a better supply of our own. We’ll keep our fingers crossed together then.